My particular alfajore consumption habit was picked up from a Portuguese pastry stall in the Upper Thatchbrook Street Market in Pimlico, London. I was not previously aware of these light, sweet biscuits with a glorious caramel inside until one particular day I needed an afternoon sweet pick me up. I walked past the stall that I had on previous occasions not taken any notice of, and suddenly what was on display caught my attention. My eyes knew what my stomach needed – at least 2 of the giant alfajores being exhibited, possibly a third (I needed quite a pick me up). So on many occasions after that I revisited that stall and became quite a regular, until a few months later the stall was closed as the owner wanted to concentrate on her family. My supply chain had been cut off. So there was only one thing to do – create them myself. Microwave the condensed milk on medium for two minutes. Stir , then microwave on medium for another two minutes. Stir again and microwave on medium-low power for another 20 minutes or until it turns to a thick and caramel color. Remembering to stir every few minutes. Cream the butter and sugar. Mix in the egg yolks, then the vanilla, brandy (or milk) and lemon zest. Set aside. In a separate bowl, mix the flour, cornflour, salt, baking soda and baking powder. With half of the dough, roll out onto a floured surface to about 5mm thick. 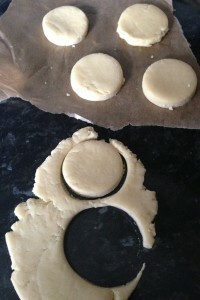 Using a rounded object such as a glass for a cutting template tool, cut out the dough into circles and transfer to a baking tray lined with baking parchment. Bake for 12 to 15 minutes, until slightly golden. Cool the cookies, and spread the dulche de leche onto the flat part of one cookie. 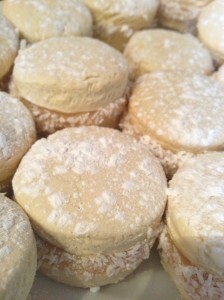 Place another cookie on top and squeeze until some of the dulche de leche oozes out. 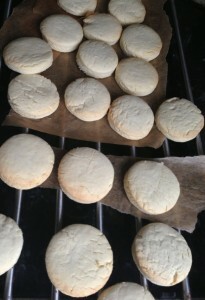 Roll in coconut, and sift some icing sugar on top.